brokenclay.org/journal > Life with a Disability > Accessibility > Progress? 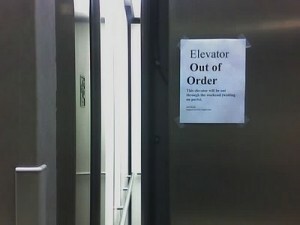 The elevator at our rec center, where I lift weights, has been out of order for the past week. Of course the weights are upstairs. I gave her suggestions some thought, but physically, after four years of lifting weights, it’s not really that hard for me to get up the stairs. Socially, years ago, I would have been devastated to let people see go up stairs like that, but at this point, I really don’t care. The comments of people passing are sadly standard. People tend to be self absorbed – there are nice people out there, but often they need to have a few seconds to process it. I have had the same people when I was waiting for somewhere to open, make sure I went first and opened a door for me, that regularly walk in the wheelchair door I have opened and am trying to exit. We are a society, but not a community. It is what I miss most. I vote you negotiate a discount or free weeks until it’s fixed. Just ’cause. You know, after a day or two, something like that would annoy me. Sometimes it takes a while for a technician to go out and fix an elevator, but after a week? I would have had attitude. Sounds like The Big Bang Theory…at least you can’t blame this on Sheldon’s home-made bomb.